If you’re looking for an affordable burlap decor or a rustic table runner for the upcoming entertaining season, you might wanna consider making this jute table runner! 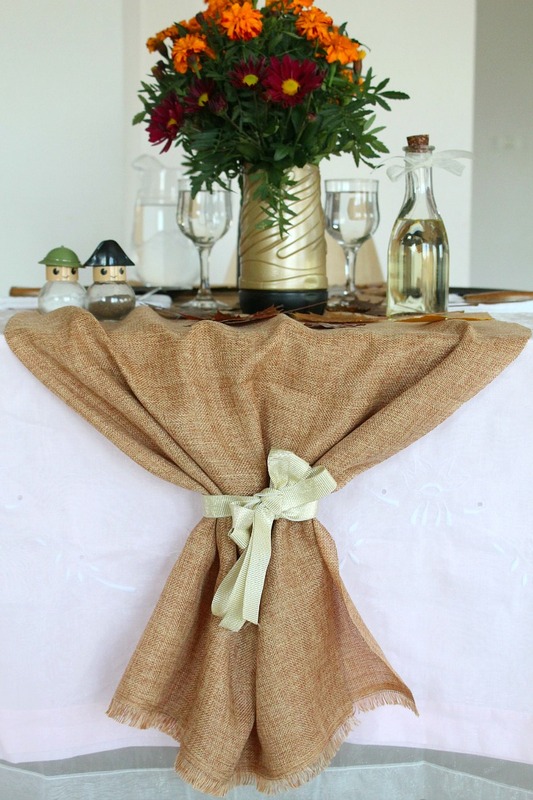 Cheap burlap table runners don’t get any easier, made from just burlap and ribbon! Holiday entertaining season has begun and this jute table runner is perfect as a Thanksgiving table runner! This rustic looking burlap table runner is affordable but it creatively adds a touch of texture to your table. It can also be casual or dressed up fancy, depending on the dinnerware you choose. I don’t pretend to be a good host as I don’t get to host a lot of parties at home. 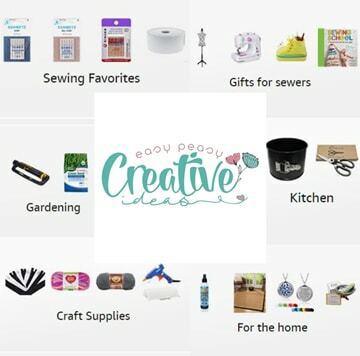 But when I do, I like to make the most out of the stuff I already have around, without it looking too “handmade” or cheap. I like pretty settings, preferably rustic, with a touch of chic. And I love a classy look, even if on a budget. Pretty much like this rustic jute table runner that I put together from burlap fabric I purchased for a future project I have in mind and some ribbon I used for this Fall Leaves Garland that I made a few days ago. In fact I just realized these two would work together perfectly for a Thanksgiving table setting! 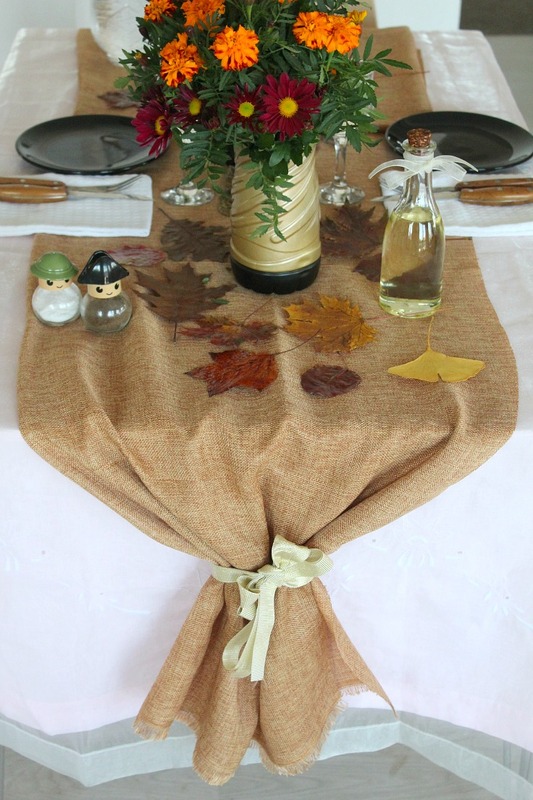 A jute table runner is a great way to dress up plain tablecloths or bare tables. I also think this DIY burlap table runner will add lots of warmth to your decor this holiday season so you could keep it on even when not entertaining. And it’s so easy to make! Just measure your table and cut the burlap according to your measurements, making sure you leave enough fabric to hang over the sides of the table. Fold the burlap in half, spread over the table in the middle, lengthwise, and loosely tie the ends with some ribbon. Then fluff the ends a bit and tidy up the burlap where it hangs down the table. 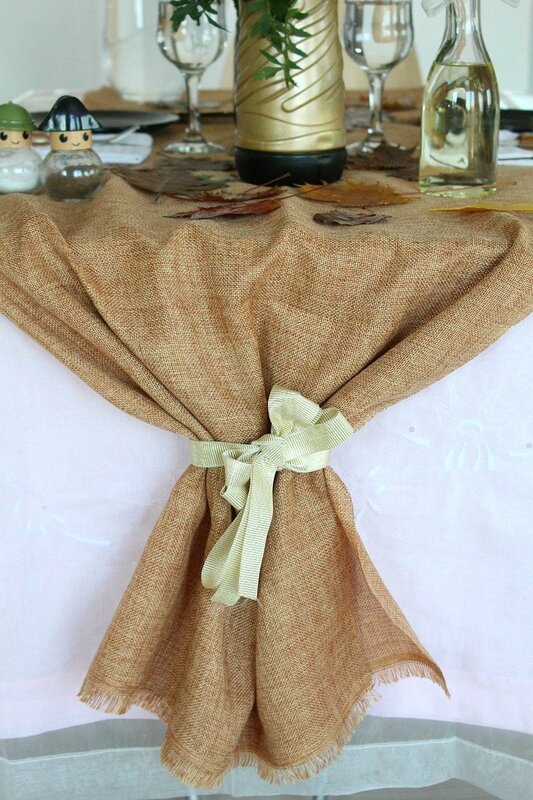 The burlap and ribbon are not the only affordable items I used for this table setting. I only have one tablecloth (I know, shame on me!) and I don’t even like it that much. I like the embroidery but not the color and the texture. It makes the tablecloth look too plain and cheap, not festive at all. So I thought I should add a bit of glamour with some organza fabric I purchased a gazillion years ago and never got to use. Because I too buy stuff I don’t need just because I find it pretty. It’s been begging me for months to make a good use out of it! I wanted to make this table setting fall inspired so I’ve spread some fall leaves and added some handmade flower vases filled with fall flowers. I like minimalist settings so I wanted things pretty simple and used plain black plates and rustic looking cutlery on white napkins. Making this country goodness setting around the burlap and ribbon DIY table runner took about 10 minutes and these were the most fun and enjoyable minutes I’ve spent in a long time. I think this jute table runner and the whole setting will be a hit at Thanksgiving! So what do you think? Will you give this jute table runner a try this season? Let me know in the comments below and don’t forget to rate this tutorial!